Cast: Johnny Depp, Freddie Highmore, David Kelly, Helena Bonham-Carter, James Fox, Christopher Lee, Eileen Essell. Directed by Tim Burton, adapted from the book by Roald Dahl. Story: Charlie Bucket wins a trip round Willy Wonka's chocolate factory. Things I'm a fan of: Johnny Depp. Tim Burton. Roald Dahl. I can't lose then, surely? Well, curiously I can. Although Charlie and the Chocolate Factory is a pretty good couple of hours, it manages to end up as less than the sum of its parts. Johnny Depp is one of my favourite actors - he can turn any role into a treat to watch. With his Willy Wonka, it takes half an hour to get used to him - he plays him as a cross between Michael Jackson and Howard Hughes, but likeable. On the surface he's playful and twee, but lurking underneath is a manipulative and mischievous malevolence directed at those who take the wee-wee. By the second half the viewer has either bought into the performance or gone to sleep, and his opinion at this stage is unlikely to change as we continue. Freddie Highmore plays the eponymous Charlie Bucket and doesn't manage to capture the same sparkle that he showed in Finding Neverland, however he's adequate. 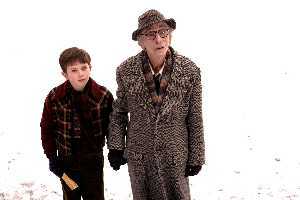 Grandpa Joe is played well by Waking Ned star David Kelly, while the other kids in the factory and their parents are all as obnoxious as they need to be, and they're all painted with Tim Burton's plastic brush, just so that we know we're not supposed to like them. The writer John August has kept the critical parts of the book in place, however he's taken one or two inadvisable liberties. Charlie isn't bribed by the rival chocolatiers, which seems a bit of a drop-off and required a simplification of the tour's ending, and there is an awful subplot fabricated to give Christopher Lee a part as Wonka Senior. It could be that I'm too familiar with the original, but this seemed to stick out like a sore thumb and seriously destroyed the ending. There was nothing wrong with the book's ending, it was consistent with the feel of the story and had the correct pace for the conclusion. This extra segment grafted in from Hollywood's rent-a-plot department played like a dog hair in a trifle and dispelled much of the magic so carefully created in the main course. Naughty movie men! Don't do it again! Charlie and the Chocolate Factory is, I suppose, as good as I could have expected. I imagine it will appeal more to the new generation of kids than to fans of the original book or the Gene Wilder movie, partly because of Danny Elfman's new get-out-of-my-head Willy Wonka theme song. It has enough of Tim Burton's story-telling skill and Johnny Depp's screen charisma to keep everyone entertained, but personally I'd take Madagascar every time. To enjoy this film you should: forgive the crap ending. Charlie and the Chocolate Factory is released in the UK on 29th July. I must confess to not being a big fan of Roald Dahl so I was not expecting a lot from the 2nd cinema romp of Charlie and the Chocolate Factory. I'd not read the book or seen the first outing with Gene Wilder, all I knew was that Charlie found a gold ticket and got a tour of some factory. I have to say I loved the film, Burton's direction and Depp's acting are fantastic and they weave a fantastic story line with a good undercurrent of values. Burton keeps the colour with some wonderful designs and stunning backdrops but the real star has to be Deep Roy who plays all the Oompa Loompas as well as the Squirrels. The story itself is very light on content in so far as we have Charlie (Highmore) and Grandpa (Kelly) who join 4 other kids and their parents on a tour of Wonka's fantastic chocolate factory. Along the way 4 of the kids get dealt their just deserts and Charlie win's the ultimate prize, good moral film for right and just always prevails. It's a wonderful film packed with candy visuals, if you have a sweet tooth go see it. tim burton is a great director. he can turn an okay movie into a brilliant movie! i really enjoyed this film! 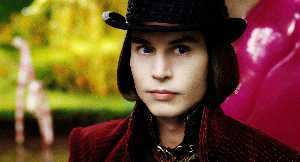 it has a great story line and you learn a lot about willy wonka.